The Needle element is a visual element representing the figure in the form of a needle. This element is intended for the Slider current value visualization. The StartPoint property assigns the start point of the needle. The EndPoint property assigns the end point of the needle. 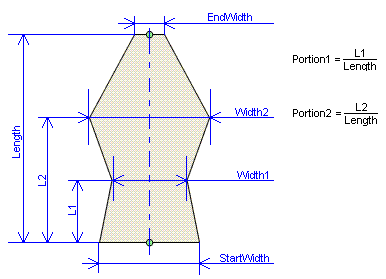 The needle base width is assigned in the StartWidth property and the needle tip width is assigned in the EndWidth property. To assign the complex geometry of the needle the NeedlePoints property is used. NeedlePoints is the collection of intermediate needle points descriptors. Each intermediate point descriptor is assigned by the needle width at a given point and the ratio between the distance from the needle base to a given point and the needle length. (See the image below). The ShowMode property assigns the needle displaying mode.